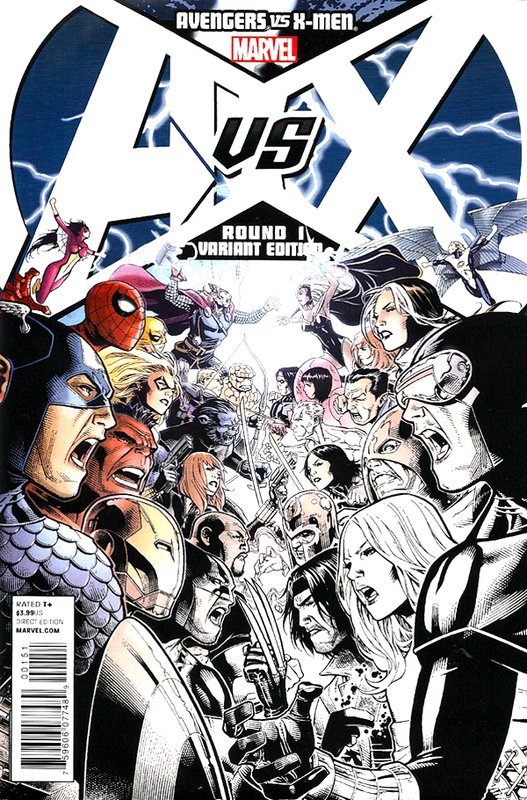 Avengers versus X-Men has roots going back to the dawn of the Marvel Universe, but it’s most closely tied to events beginning in 2005’s House of M, and focuses squarely on the “mutant messiah,” Hope Summers, introduced in X-Men: Messiah Complex (both series were covered in the last two volumes of Standard Deviations). 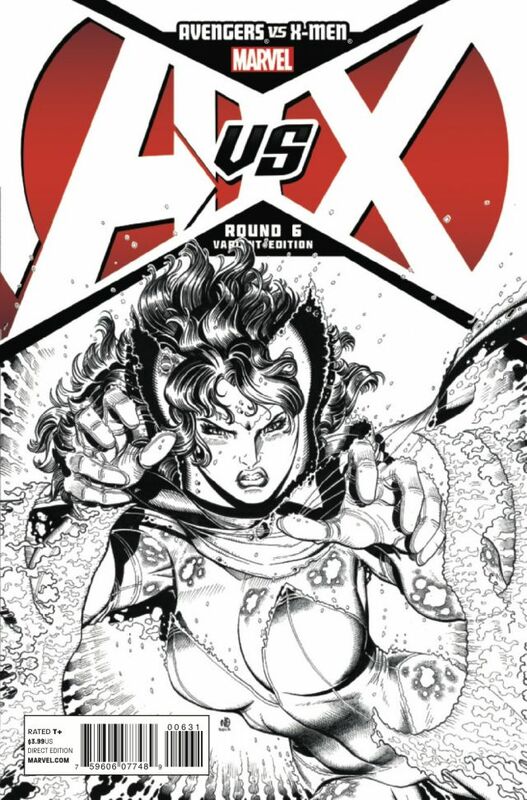 March’s Avengers vs X-Men #0 prequel issue put both Hope and the Scarlet Witch (the primary antagonist of House of M) in the spotlight before the fists started flying, with interior art and a regular cover by Frank Cho. 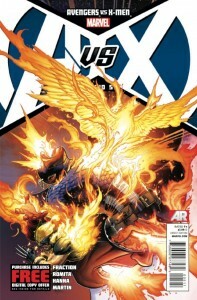 Two variant covers for the “zero” issue were available in the forms of a gorgeous 1:50 cover featuring the Phoenix force arriving to burn the Earth by Stephanie Hans and a 1:25 wraparound image of the two teams fighting by Jim Cheung. 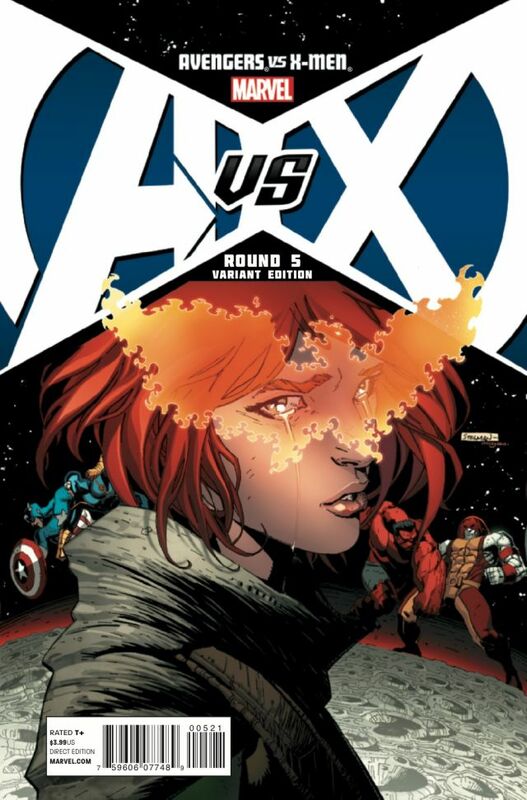 Cheung is fresh off Avengers: Children’s Crusade (another series that plays directly into AvX and returned the Scarlet Witch to prominence) and will provide regular covers for the remainder of the series. 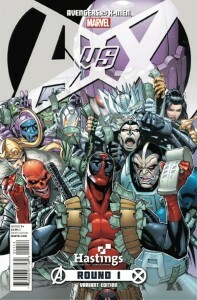 Avengers vs X-Men #1 features nine cover images in addition to Jim Cheung’s regular cover. 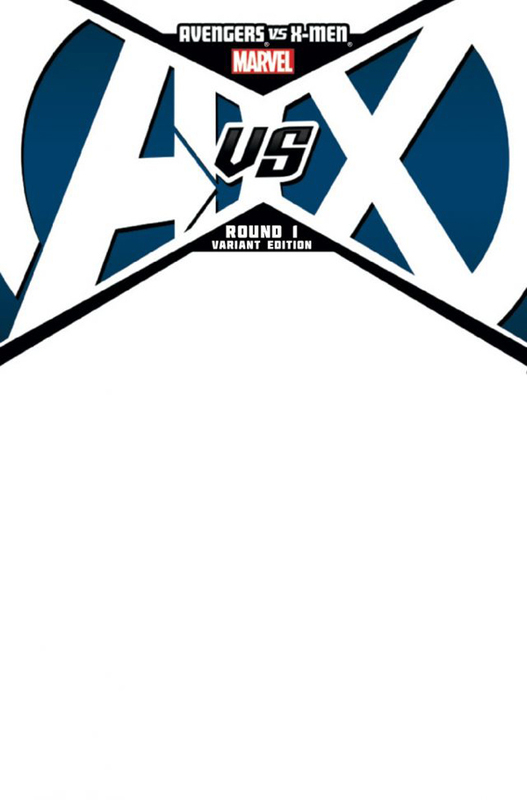 An obligatory “blank” variant is part of the set along with a “party” variant of Cheung’s cover that was available as part of Marvel’s AvX retailer launch events held on Tuesday night at stores across the country. The “party” image employs an odd looking gradient to the color that I don’t quite understand, but as you’ll see, a more straightforward color/black-and-white motif can be found in some of the other variants for this series. Details were hard to come by regarding the scarcity of this book, but it’s listed on eBay for over $100. 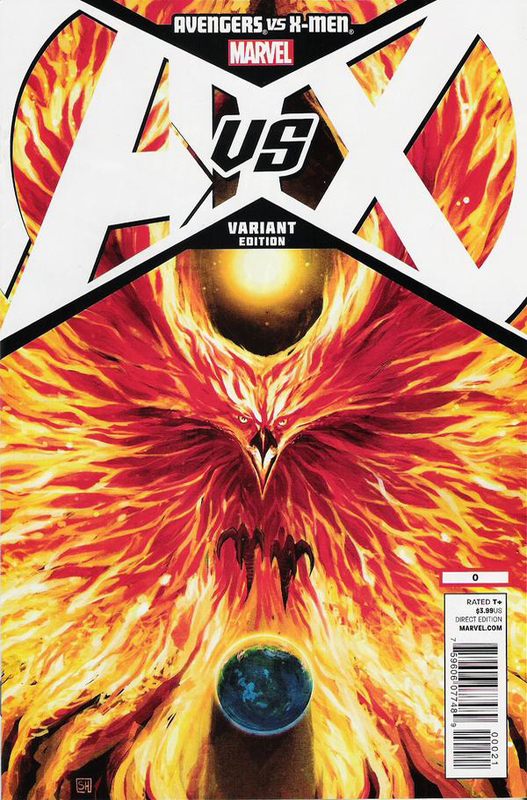 As various previews made clear, two of the Marvel Universe’s greatest superhero teams will come to blows over the return of the Phoenix as it cuts a swath of destruction along its way to Earth. 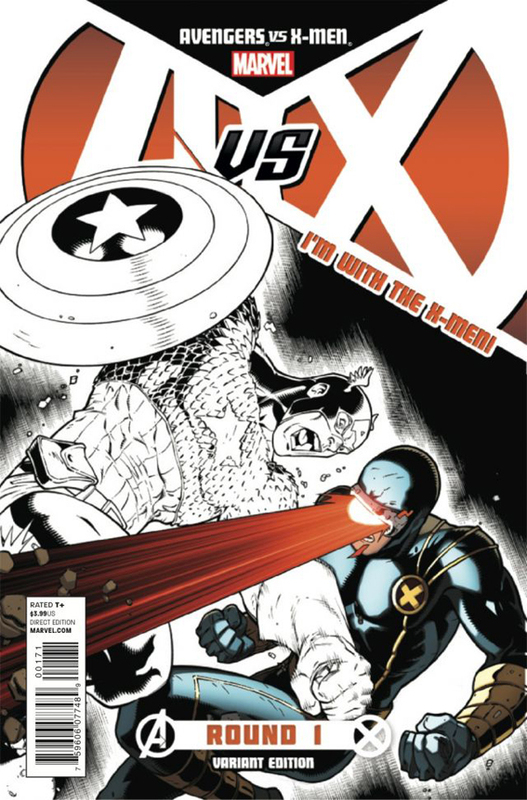 Captain America and the Avengers step in to save the planet from the cosmic firebird putting them squarely at odds with Cyclops’ X-Men, who believe the Phoenix to be a means of saving the mutant race from extinction. The division of the heroes is reflected in the variant covers for AvX with two team variants shipping for every issue. 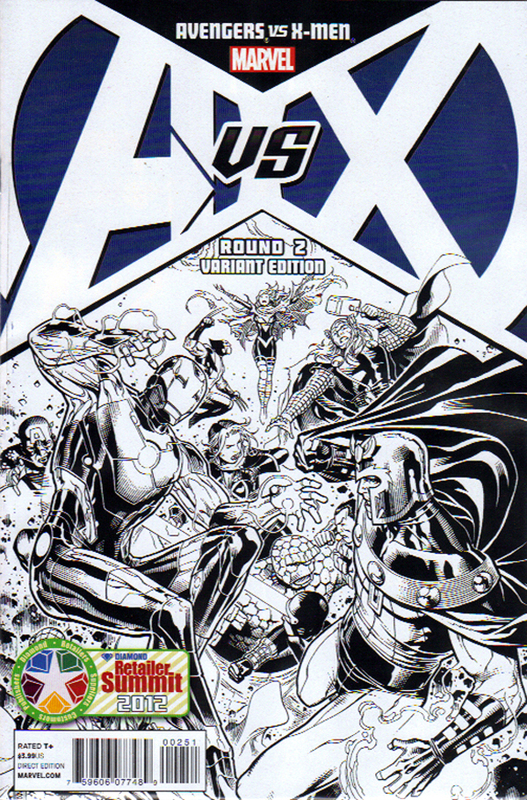 The images feature a representative from each team locked in battle with one character in full color and the other in black and white along with the text “I’m with the X-Men/Avengers” added to the AvX logo. 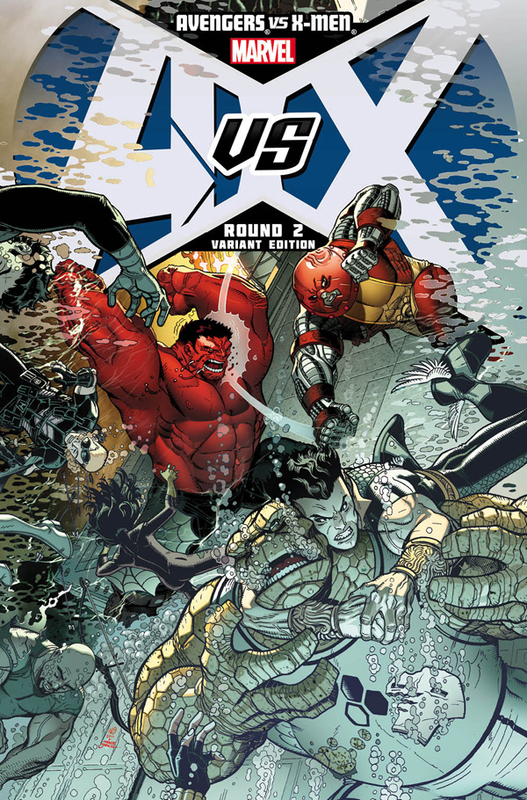 Stegman’s image for the team variants of AvX #1 was also available as a 1:100 full color variant and a 1:200 sketch variant, with each respectively commanding prices of $60 and $100 and greater. At least one similarly distributed variant by a top name artist will be available with each issue of the main series, but the full color image of the future team variant covers will drop to a 1:25 ratio. 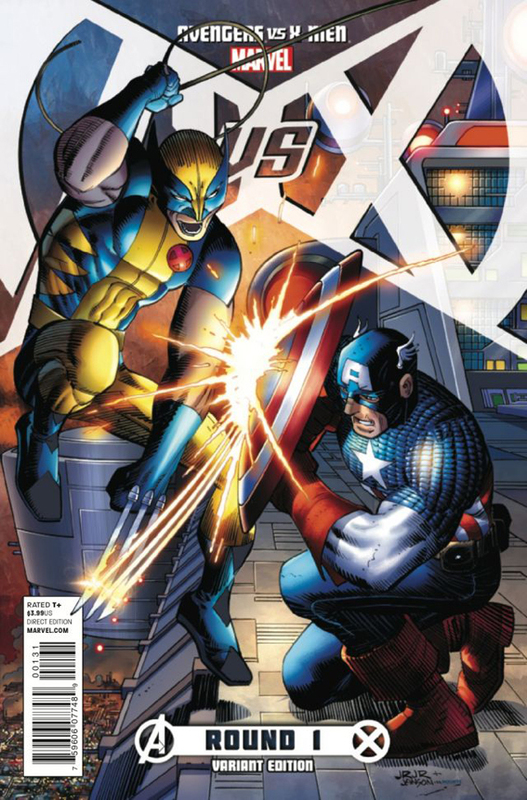 A cover image of Wolverine fighting Captain America by AvX #1 interior artist John Romita, Jr. shipped as the 1:25 variant for issue one and may reveal a change in Wolverine’s current loyalty to the Avengers. 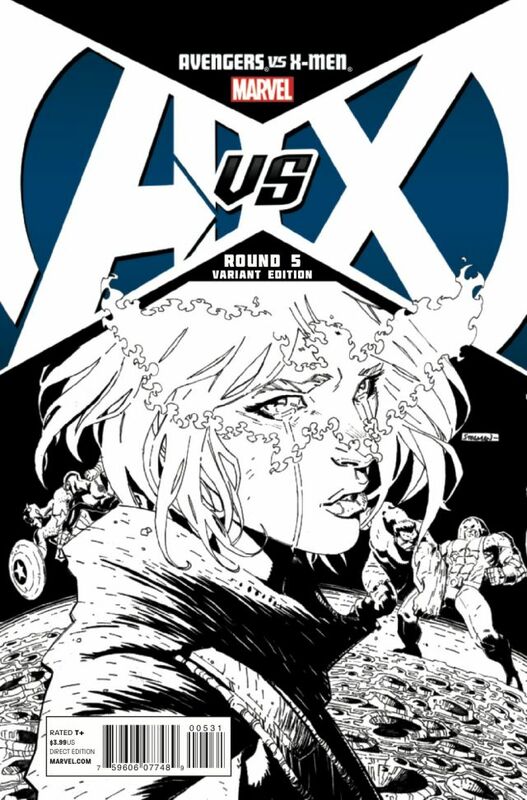 Rounding out the variants for “Round 1” are a pair of retailer exclusive covers available from Hastings Entertainment stores and New York’s Midtown Comics. These images are without question my favorite of the set. 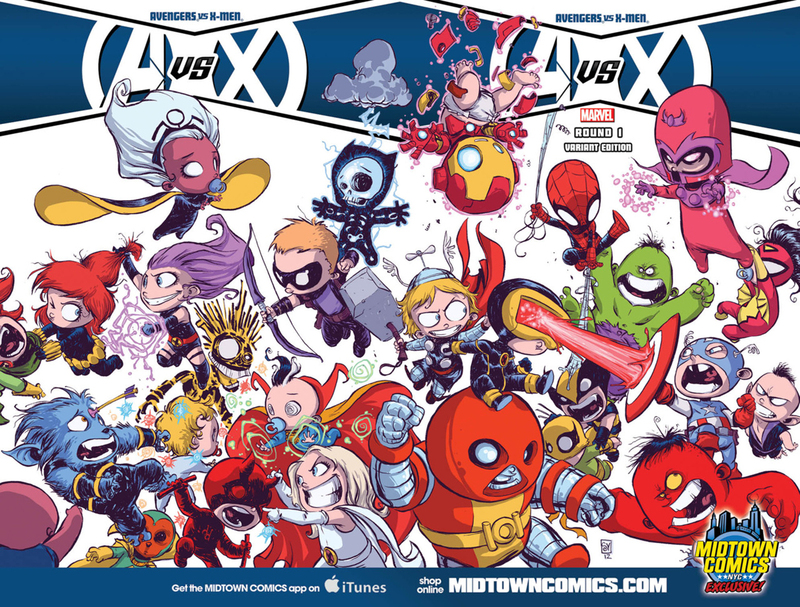 Skottie Young’s “baby” heroes are adorable but he also throws in a helping of sight gags involving their powers that make his wraparound cover great. Similarly, Paco Medina’s Deadpool taking bets from a host of Avengers and X-Men villains is just plain fun and made this a must buy for me. 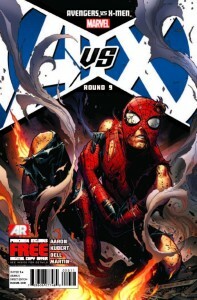 UPDATE: April 13th, 2012 – Olivier Coipel’s C2E2 Avengers vs X-Men #1 variant. 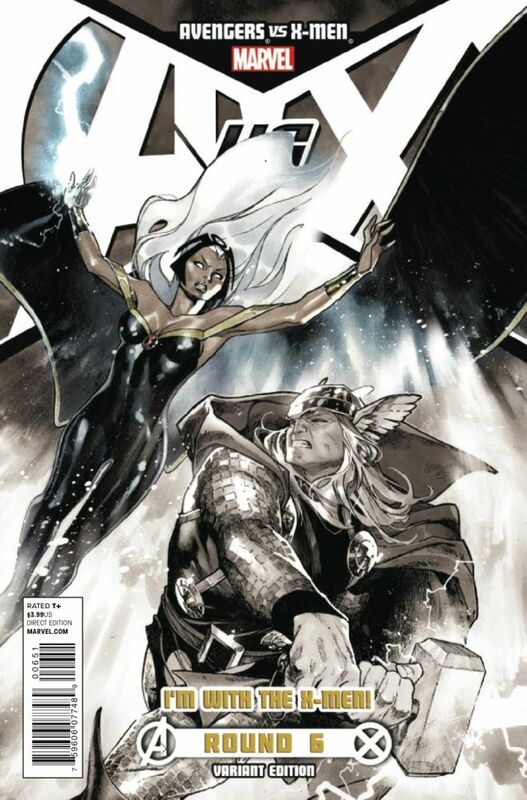 The annual C2E2 event comes to Chicago this weekend, and among all of the other programming and exclusives for fans in attendance comes yet another edition of AvX #1 by artist Olivier Coipel. 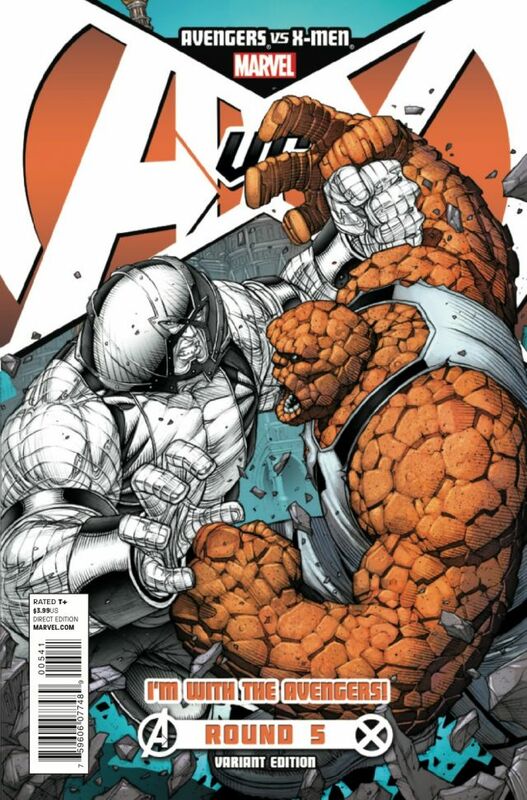 Coipel will be providing interior art for later issues of the series along with John Romita, Jr. and Adam Kubert, but as far I can tell this will be his only cover art for the series. The composition of the image is similar to Coipel’s 2010 X-Men #1 variant and it’s something I would consider adding to my collection. I’m not sure of the price or availability of this book, but any information from fans in attendance at this year’s C2E2 is welcome! UPDATE: April 19th, 2012 – Avengers vs X-Men #2. 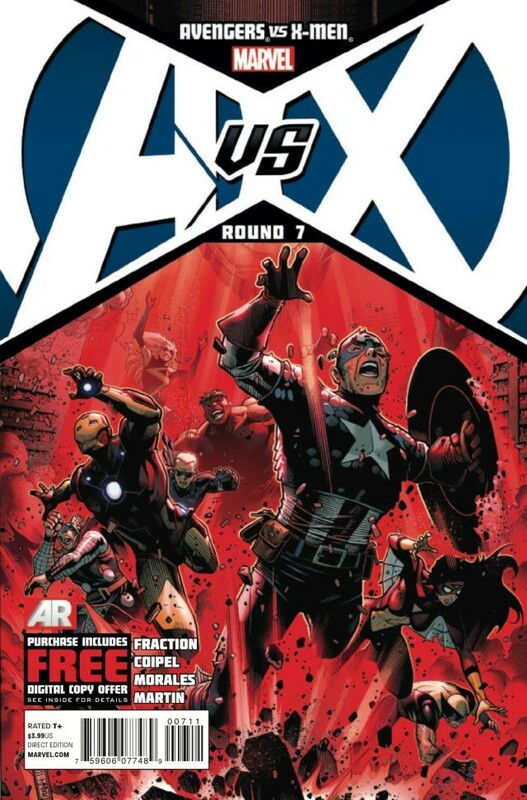 Avengers vs X-Men returned to comic book shops yesterday for “Round 2” of the twelve-part, bi-monthly, knock-down-drag-out battle between Marvel’s two most popular superteams. 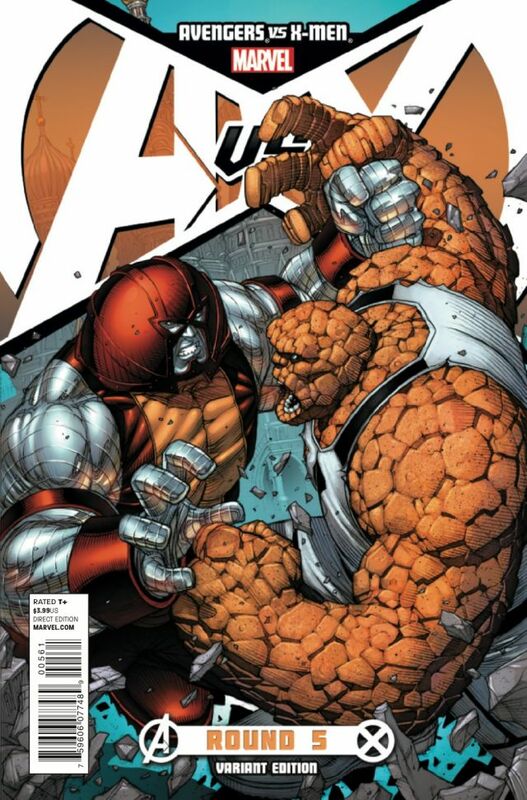 Jim Cheung once again provided the regular cover as he will for the entire series, and the number of variant editions was scaled back to a seemingly more manageable six. 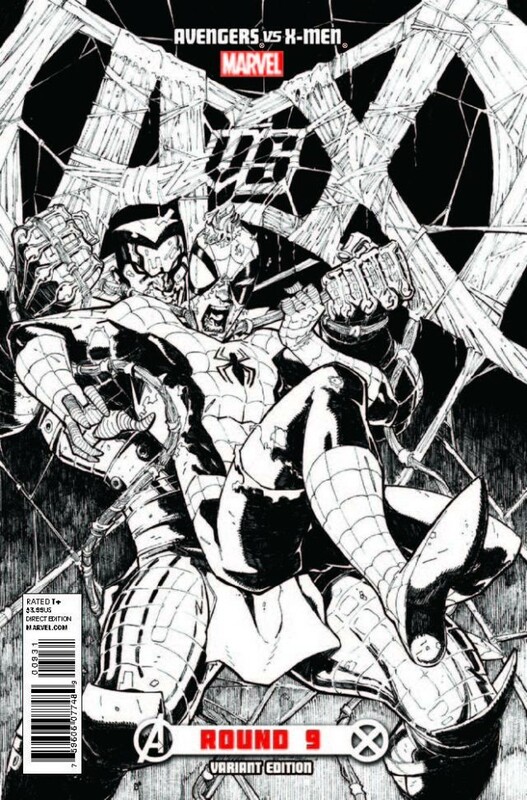 Included in this count is the “DCD Summit 2012 Sketch Cover” which features a black-and-white version Cheung’s image. This book was limited to one per customer from Midtown Comics but sold at cover price. While it’s currently sold out through the online retailer, look for this to be available in the $5-10 range for the immediate future. 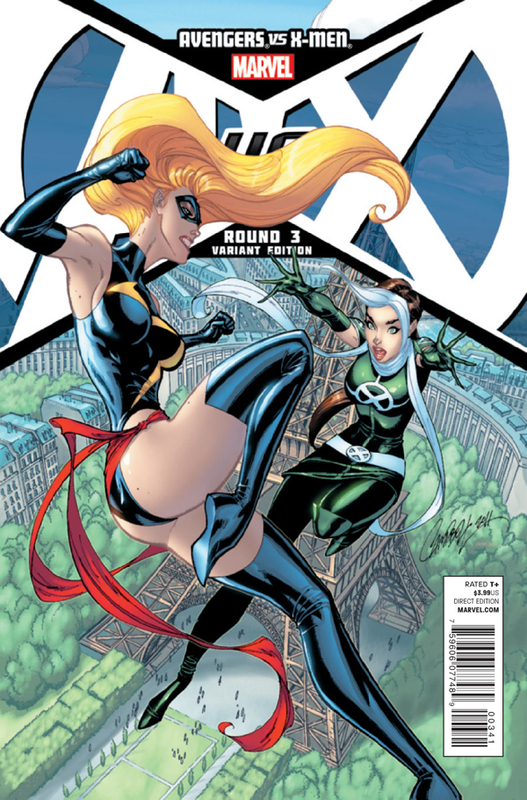 Once again the book featured two “team/store” variants with the color/black-and-white motif as well as a full color version of the image this time by Carlo Pagulayan. 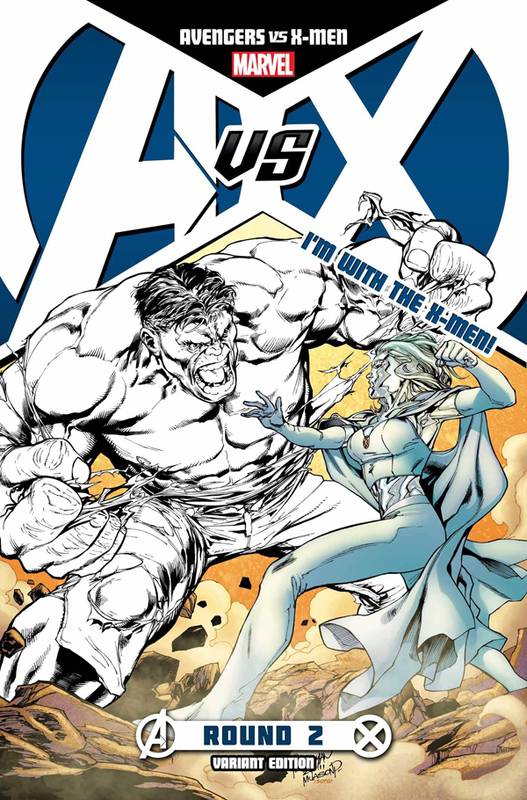 The image features Emma Frost versus Hulk and shipped as a 1:25 variant unlike Ryan Stegman’s cover for AvX #1 featuring Cyclops and Captain America that shipped 1:100 with a 1:200 sketch version. As the full color team variants become more readily available, the availability of individual team/store variants has changed as well. 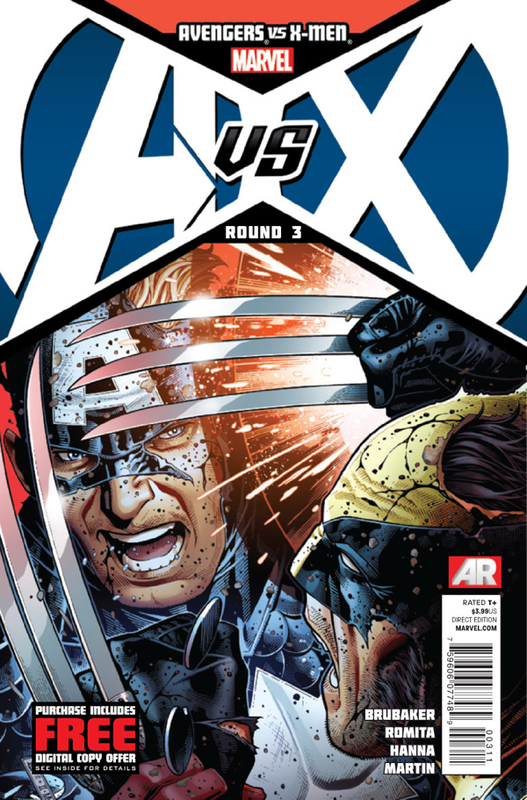 Shops can order any number of the variants associated with side their store chose provided their orders for each issue are at least ninety percent of their number for AvX #1. This is a huge number for Marvel to require and the number of shops carrying the team/store variants could drop considerably as a consequence. 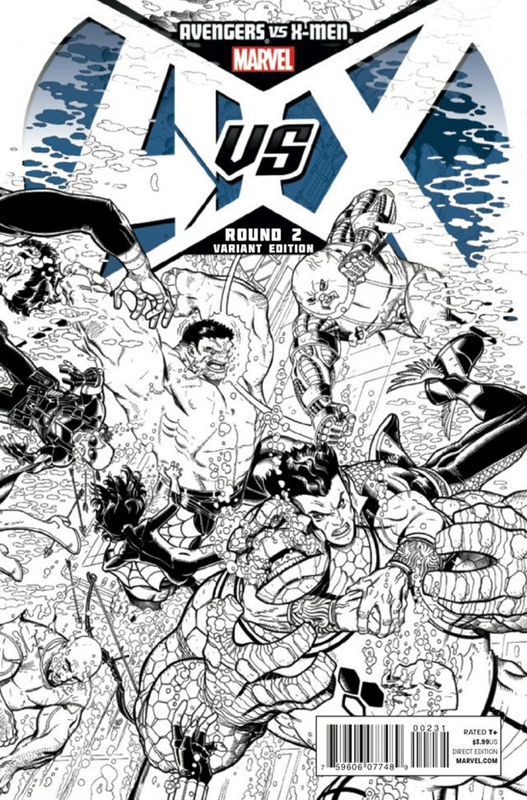 Ensuring that there will still be relatively scarce editions of the remaining issues of AvX, a variant cover for AvX #2 by Nick Bradshaw shipped as a 1:100 variant with a 1:200 sketch variant. Prices for this book are currently around $50, but may not hold at those levels simply because this is not a first issue and even the most dedicated collectors may not be in the market for high dollar books like that every two weeks. 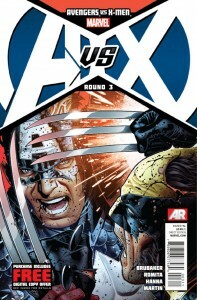 UPDATE: May 2nd, 2012 – Avengers vs X-Men #3. That’s at least six covers for each issue of the 12-issue series. 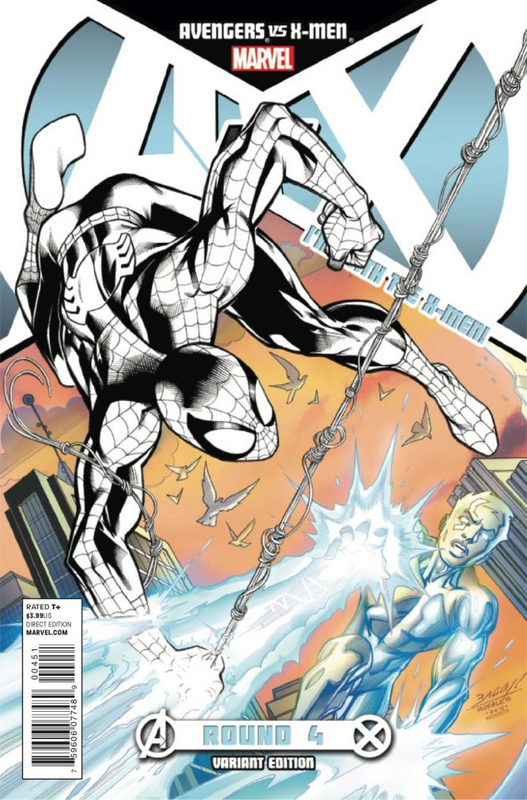 This time around the 1:100 and 1:200 covers feature art by Ultimate Spider-Man‘s Sara Pichelli and it’s the best of the bunch for issue #3. Hope Summers has become a character I’m really invested in and her struggle with the seductive power of the Phoenix force is perfectly captured here. 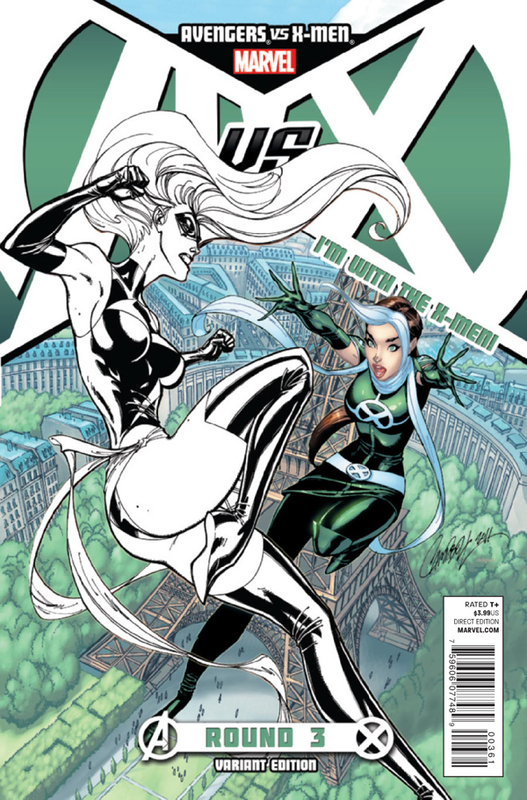 The “team/store” variants using the color/black-and-white motif, and the full color 1:25 variant, feature the artwork of J. Scott Campbell this time. Rogue and Ms. Marvel are another pair of characters I follow pretty closely and their long history of being at odds makes for one of the most natural confrontations of the series (despite all the unnatural elements of this image). 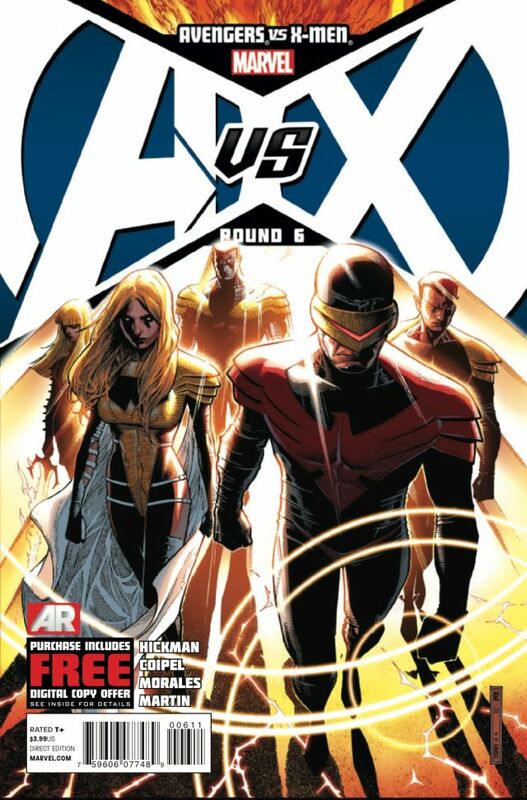 As mentioned last time, shops can order any number of the variants associated with their team provided their orders for each issue are at least ninety percent of their number for AvX #1. It will be interesting to how many stores maintain those numbers over the course of the series. UPDATE: May 16th, 2012 – Avengers vs X-Men #4. 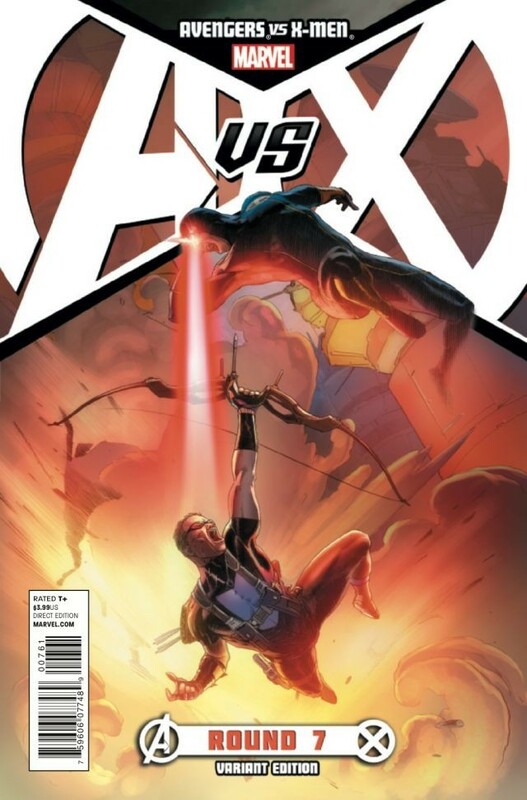 Of all the options for Avengers versus X-Men #4, I think my favorite is Jimmy Cheung’s regular cover. 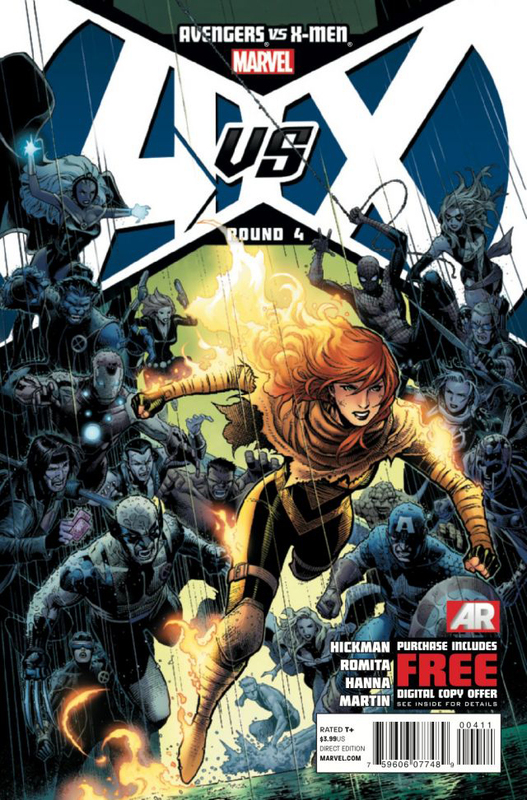 The image of Hope Summers on the run from both the Avengers and the X-Men is compelling to me, but what works best for this image is the way the character’s are given more real estate in the foreground rather than being obscured by the giant AvX logo as has been the case with earlier issue of this series. 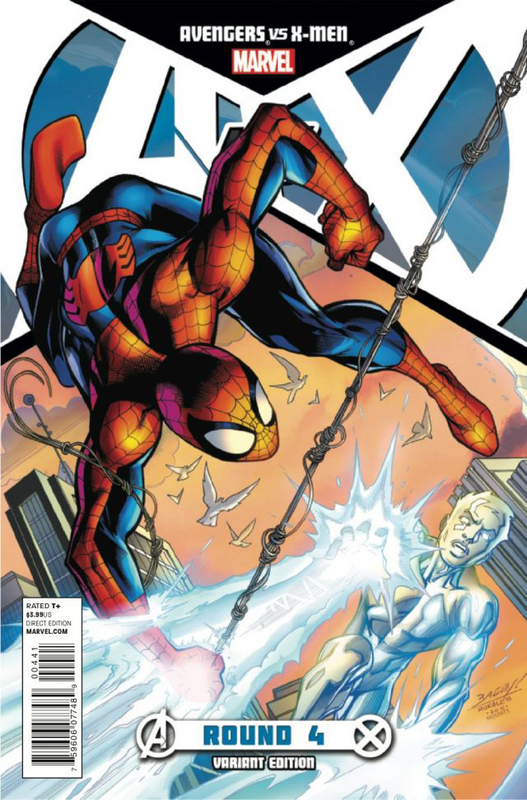 Mark Bagley’s Spiderman versus Iceman image for the 1:25 variant of AvX #4 is also one that I really like, but the unfortunate downside is that this is an encounter that never occurs within the pages the book. 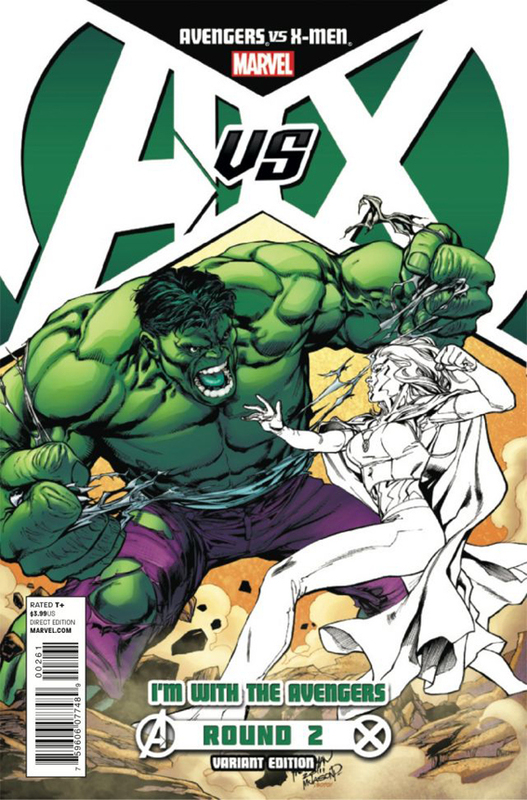 Much like last issue’s cover featuring Rogue versus Ms. Marvel, it’s one of those battles the just seems so natural to come out of this event. Even though these characters don’t have the same history in the Marvel Universe that they do on the Spider-Man and His Amazing Friends cartoon, it might have been nice to see these two point out some of the absurdity of the war raging around them. There’s a good chance that this fight may happen at some point one of the ancillary titles, but I can at least appreciate seeing it here by a classic Spidey artist like Bagley. 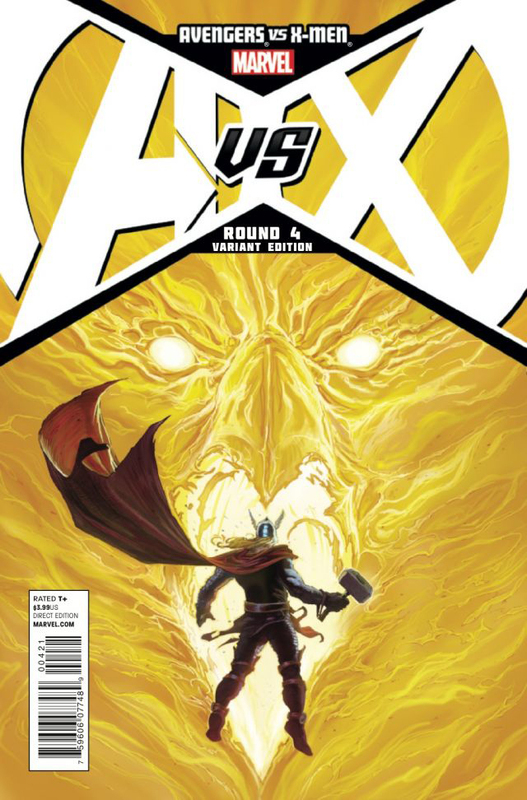 Jerome Opena’s image of Thor versus the Phoenix is simply amazing. I’m not usually a fan of sketch variant covers, but I really that like you can see the blue line work and that it’s a very rough version of his cover art. It’s also beautiful in color, which is still what I prefer here, but this is the first of the 1:200 variants for the series that I think I would ever seek out. UPDATE: June 6th, 2012 – Avengers vs X-Men #5. 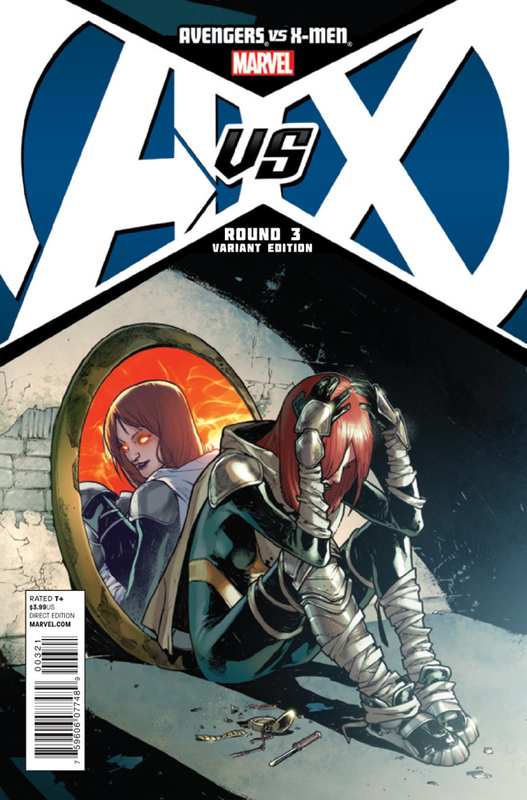 Ryan Stegman returns to provide the 1:100 and 1:200 variants for Avengers versus X-Men #5, and his tragic image of Hope Summers takes the top honors for this set of covers. 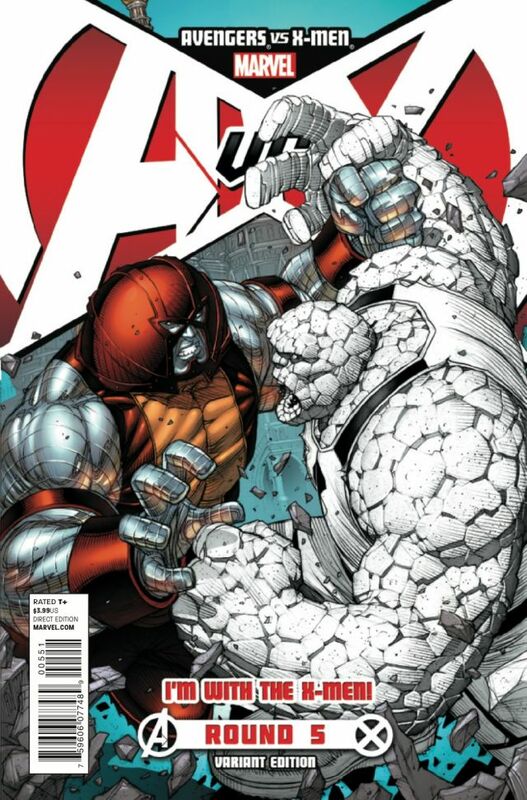 I’m a longtime fan of Dale Keown’s work, but his image of Thing vs. Colossus for the 1:25 and team variants just doesn’t do much for me. I do like Jimmy Cheung’s regular cover featuring Captain America beset by the Phoenix, but Hope’s story is far more interesting to me and Stegman’s image captures it perfectly. Seeing her awaiting the Phoenix Force on the moon as the battle between her friends over her fate rages behind her typifies the story so far. 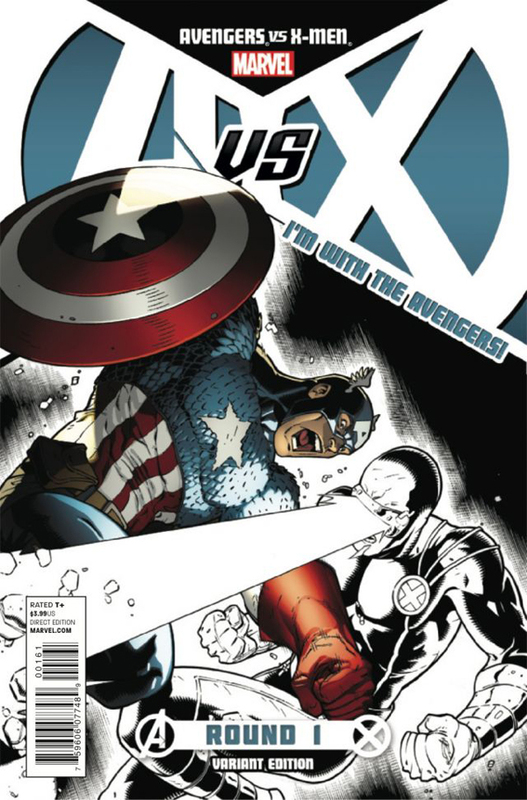 UPDATE: June 20th, 2012 – Avengers vs X-Men #6. Any Olivier Coipel image of Thor is likely to gain my approval and throwing in Storm just sets his 1:25 variant for Avengers versus X-Men #6 even further apart from its competition. That’s not to say that Jimmy Cheung’s regular cover featuring the “Phoenix Five” doesn’t look great, but it isn’t helped by the fact that I’m not totally sold on this new plot twist. An early look at Coipel’s interior art has done a lot to sway my opinion and I always appreciate when there’s cover art from the interior artist on a book. 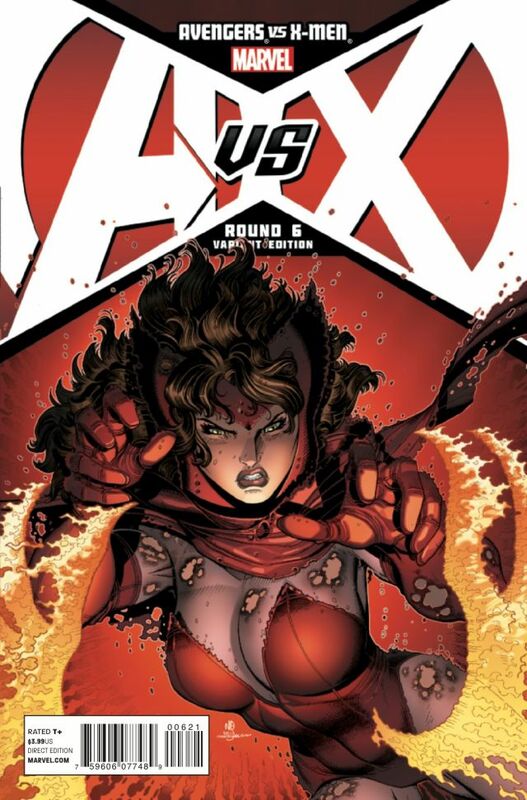 Unfortunately, something about Nick Bradshaw’s Scarlet Witch covers doesn’t quite work for me. While I’m anxious to see her more involved in the story, the image used for this issues 1:100 and 1:200 variants isn’t my cup of tea. 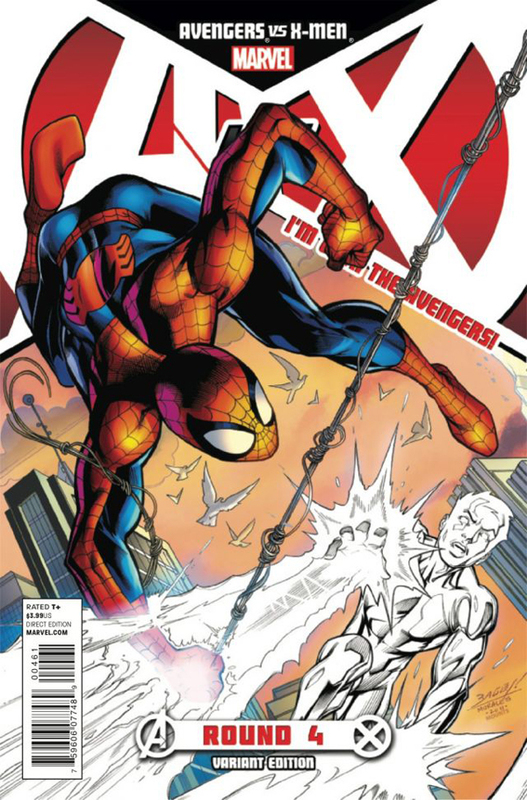 UPDATE: July 7th, 2012 – Avengers vs X-Men #7. Esad Ribic’s 1:25 cover image of Hawkeye versus Cyclops is stunning, but we’ve reached a point where the promotional images for Avengers versus X-Men being used for these variants have fallen behind the story’s content. Not only does this match up not occur within the pages of issue #7, Cyclops has been physically and psychically transformed to the point where he doesn’t even appear in the form depicted. 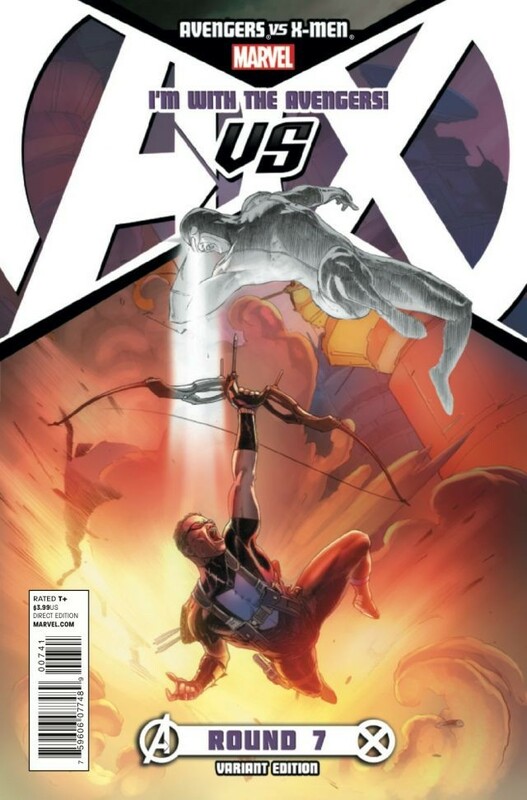 This absolutely no fault of Ribic, who turned in a great piece for a fight I’d actually like to see, but this can’t possibly stack up with Sara Pichelli’s haunting image of what actually awaits Hawkeye in the pages of this book at the hands of Emma Frost on the 1:100 and 1:200 variants or the damage Cyclops is now capable of doing to an entire team of Avengers on Jimmy Cheung’s regular cover. Judging these covers on the merits of the images alone is tough this time around, but putting them in the context of the story gives the edge to Pichelli (plus the lighting effects on the diamonds and flame look particularly amazing). 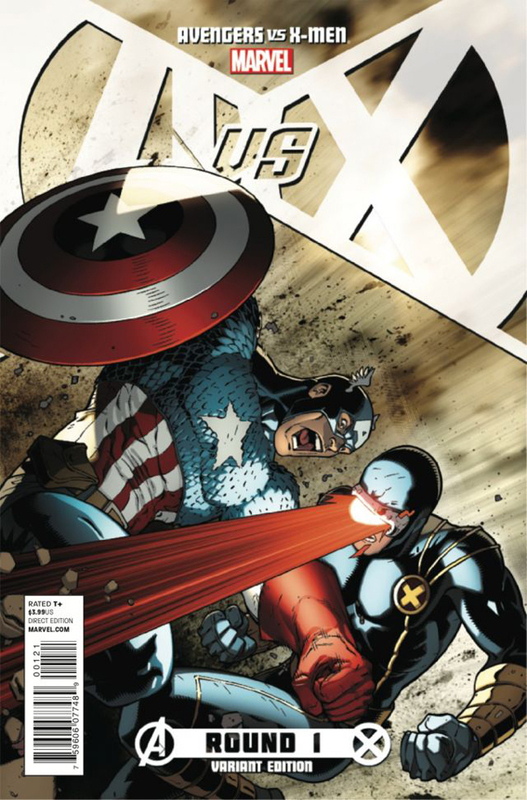 UPDATE: July 19th, 2012 – Avengers vs X-Men #8. I’m a sucker for Alan Davis’ art and his Beast versus Luke Cage cover for this issue is great. 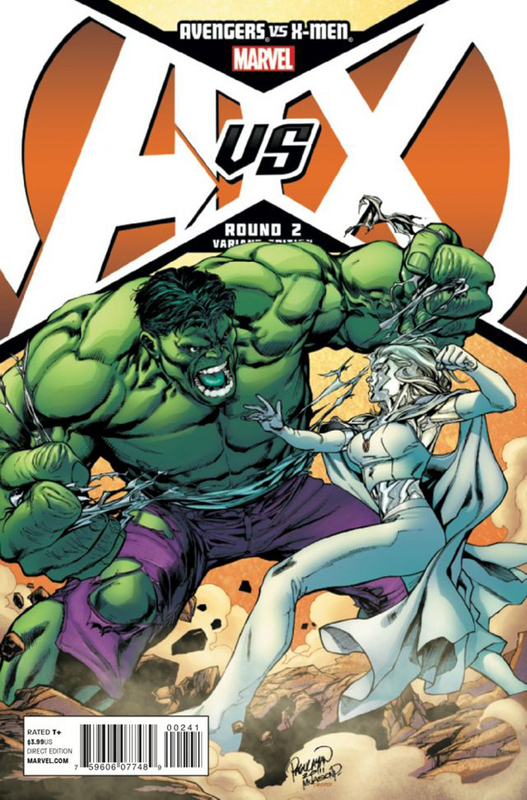 I can look past all the confusion surrounding whose side Beast is currently on and just be thankful that this image for Avengers versus X-Men #8 could never be construed as a spoiler of any kind as a result. It’s a great cover among a set of great covers that has actually managed to grow with this issue bringing the total to 7 covers. 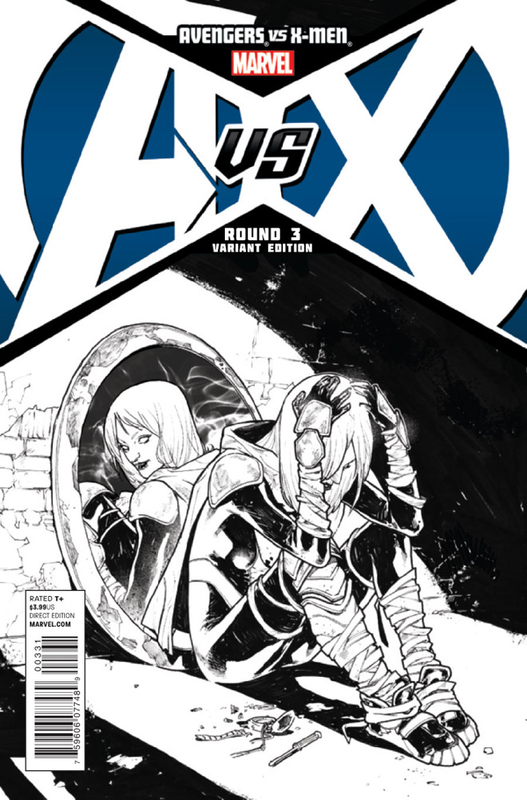 Davis’ image appears in full color for the 1:25 variant as well as partial black and white for the “team” variants. It’s joined by the typical 1:100 and 1:200 sketch variant this time by Jerome Opena, but also entering the mix is a 1:50 variant by interior artist Adam Kubert who takes over with this issue. I’m not as thrilled with Opena’s Avengers image as I was with his Thor cover to issue #4, but if any accompanying X-Men image makes an appearance I may change my mind. Kubert’s depiction of the “Phoenix Five” is a different matter entirely (what can I say, I’m with the X-Men). It’s reminiscent of Jimmy Cheung’s regular cover for issue #6, and while each figure is more easily distinguishable in Kubert’s image I think prefer the Cheung cover. Of course, that didn’t stop me from tracking the Kubert variant down. As the series marches along toward the final act, asking prices for these variants are predictably slipping a bit. At many shops, 1:25 variants should go for around $8, 1:50s around $15-20, and 1:100s closer to $35. The 1:200 sketch variants are a bit more unpredictable as most stores are unlikely to be ordering enough copies to see them at this point. Even Midtown Comics has backed off of their asking prices of $20/$85/$200 to $10/$60/$100 for the 1:25/100/200 respectively and the 1:50 is priced at $30. UPDATE: August 1st, 2012 – Avengers vs X-Men #9. It appears the Adam Kubert 1:50 variants may be a part of these sets for the remainder of the series as another ships today with Avengers versus X-Men #9. 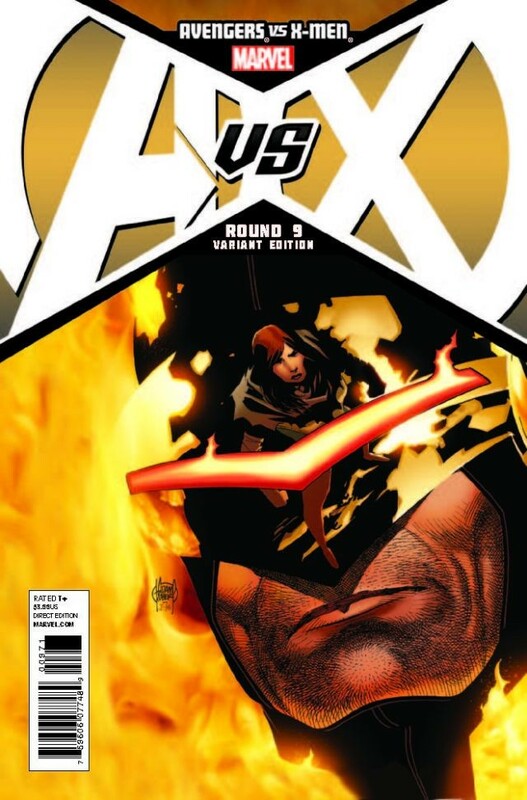 The image depicts the Phoenix powered Cyclops confronting Hope Summers and it’s a strong entry into this ridiculously large family of variants. It would be my top choice for this issue, but the regular Jimmy Cheung cover featuring a battered Spider-Man really can’t be beaten. It reminds me of the Doctor Doom cover of Secret Wars #10 and with the rumblings of major things in store for Spidey this issue (not to mention all the cosmic power being thrown around) I can’t wait to get my hands on it. For the 1:100 and 1:200 variants, Ryan Stegman turns in what is likely his final piece for the series and it is easily his most dynamic yet. 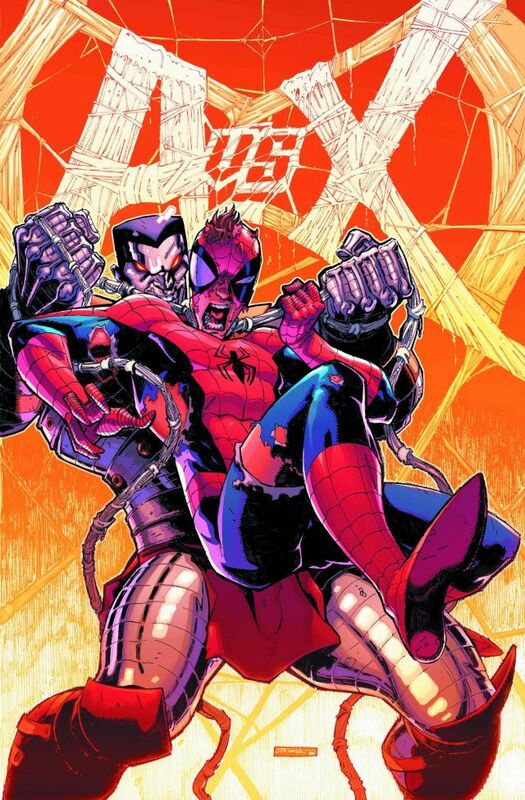 While I’d rather not see Colossus viciously attacking Spider-Man in a heinous “Pete on Pete” crime, he’s not pulling any punches in Stegman’s image. This, combined with the preview circulating for today’s issue, has me genuinely concerned about our friendly neighborhood wall-crawler’s well being. 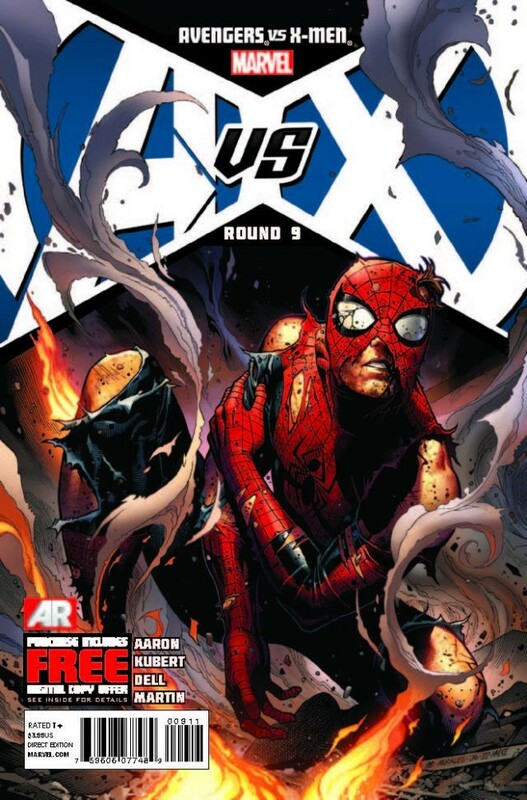 I also like the way the webbing has not only been used as a choking hazard but has transformed the AvX logo as we haven’t really seen that do so far among all of these various cover images. 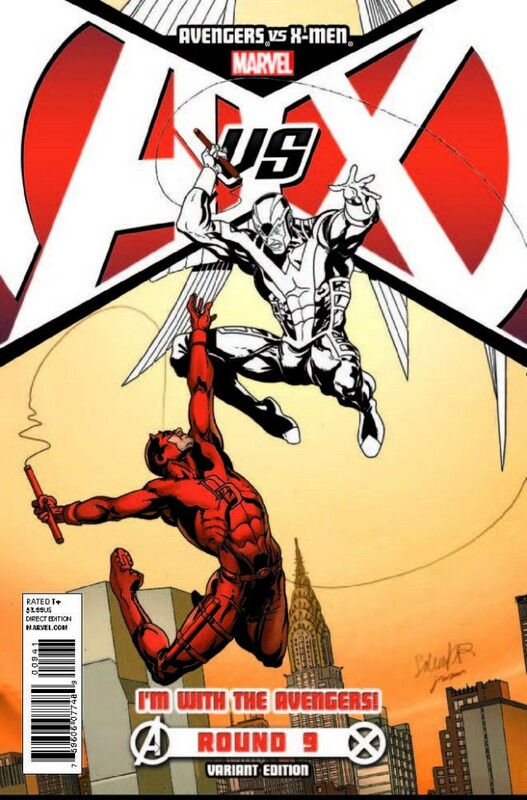 The set is rounded out with 1:25 and team variants from Salvador Larocca featuring Daredevil versus Archangel. I had mentioned previously that these particular variants are becoming farther and farther removed from the contents of the book and by all indications this may be the most detached yet. 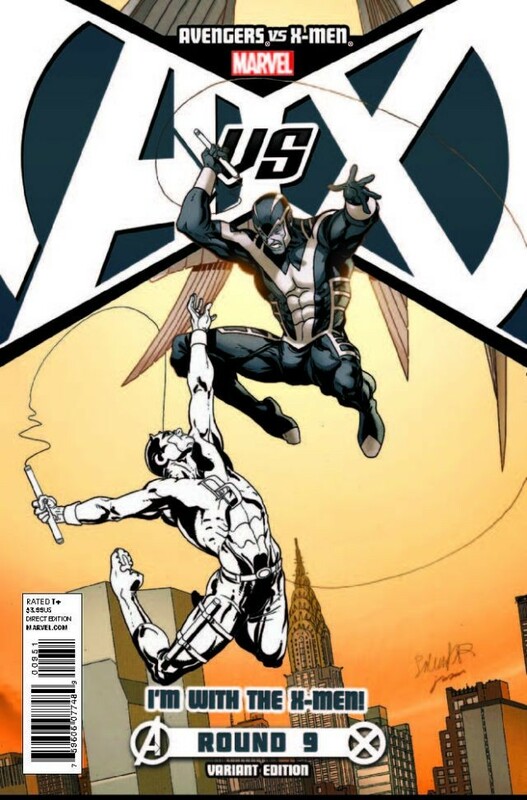 Even when this image first appeared as a teaser for the series eight months ago, it was somewhat outdated given current events with Archangel in the pages of Uncanny X-Force, and seeing it here is somewhat disappointing despite it being a perfectly fine cover. UPDATE: August 15th, 2012 – Avengers vs X-Men #10. 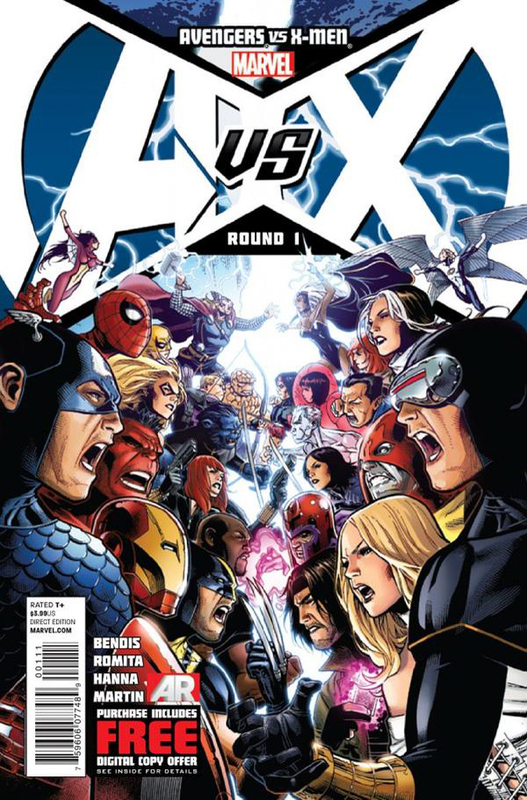 This is a really tough group of cover images to evaluate as none of the variants for AvX #10 really do much for me. Humberto Ramos’ 1:25 “fight” variant featuring Spider-Woman and Gambit doesn’t really convey that the two are actually fighting, but I do like the way the coloring of the logo fits together on the X-Men team variant and the full color version of the image. Similarly, Andy Kuburt’s 1:50 variant has me wondering exactly what I’m looking at as Hope Summers appears to be punching some sort of prismatic Cyclops who’s digitally breaking down around the edges. It’s interesting, but it almost seems as if the version presented in today’s digital shipping list is incomplete. Nick Bradshaw’s 1:100 and 1:200 variants featuring the Avengers is decent, but not really what I’m looking for. I’m more of an X-Men fan than an Avengers fan and seeing another 1:100 dedicated to that team while there have been none of any group of X-Men is a little disappointing. The 1:200 sketch variant looks particularly nice as some of the impact seems to be lost in the color version. His image is the best of the variants this time around, but Jim Cheung’s regular cover is once again my preferred choice of the bunch. I’m glad to see the Scarlet Witch prominently featured and I hope it reflects what lies within the pages of this issue. Maybe we’ll get more Hope Summers to go along with it. 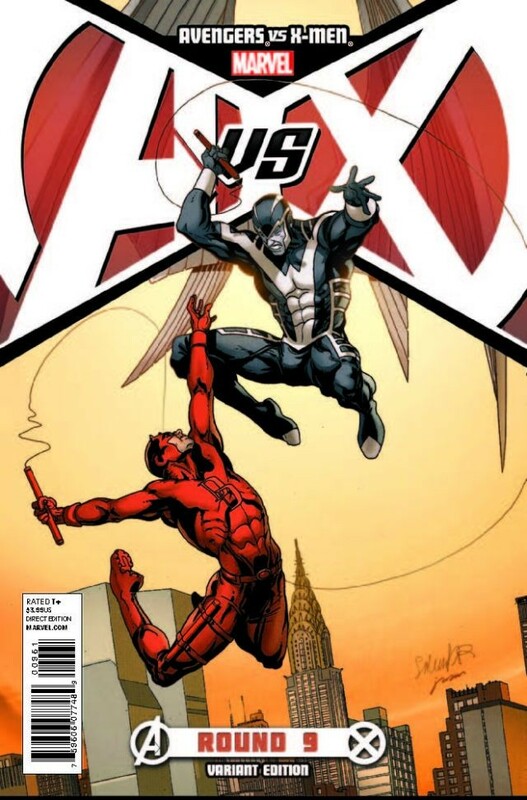 UPDATE: September 14th, 2012 – Avengers vs X-Men #11. 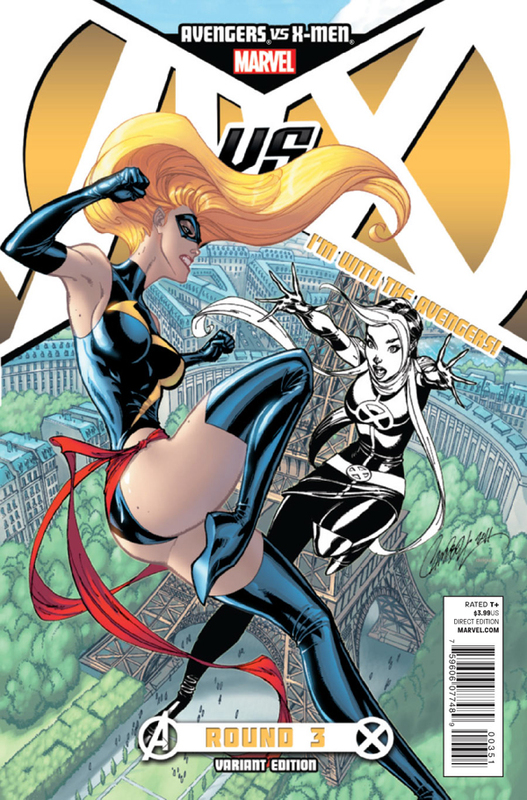 Jimmy Cheung’s regular cover to Avengers vs. X-Men #11 depicting Cyclops locked in battle with Emma Frost culminates many years of stories surrounding the two. 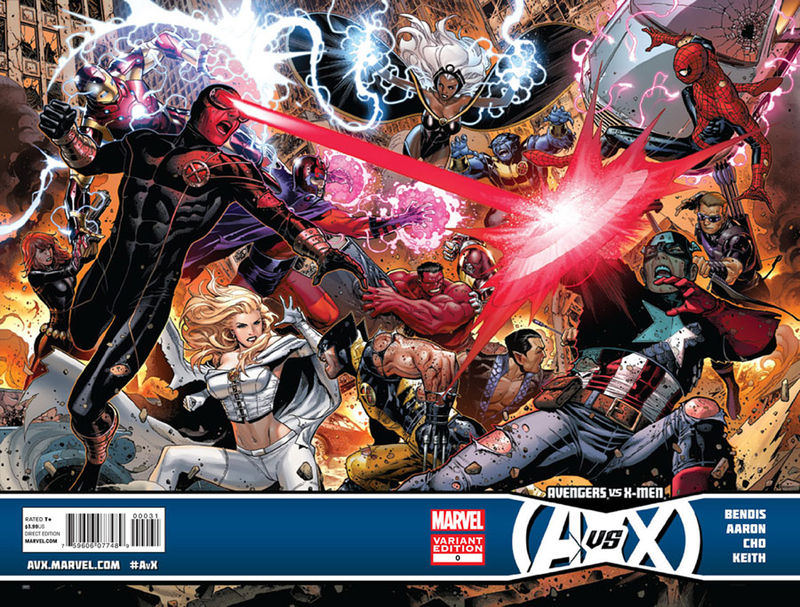 The image is powerful, but a lot of the background detail with the Avengers and X-Men looking on is lost amongst the lighting effects and the book’s cover logo. Many readers have been waiting for Emma to revert to type as a villain, and this image made it easy to assume that would be the case on the pages within as Emma has been twisted by the power of the Phoenix. Sara Pichelli’s variant tells the real story, however, in incredibly dramatic fashion. 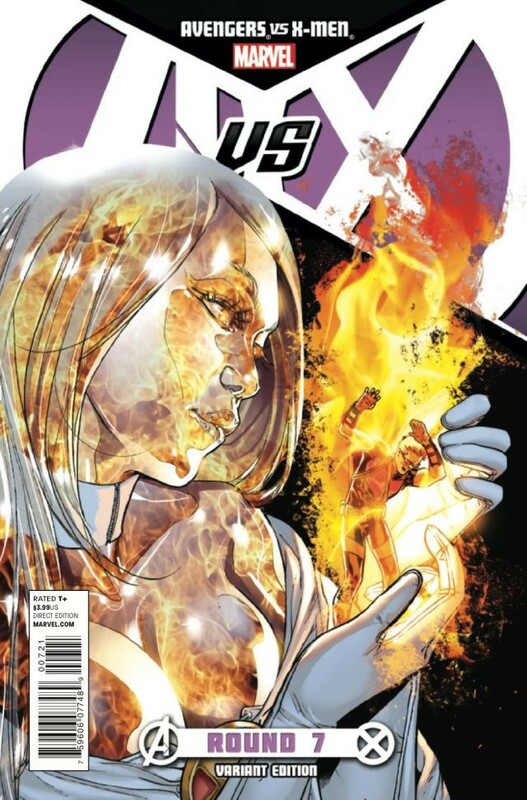 Her image of Cyclops turning on the woman he loved is easily the best of this issue’s cover images. 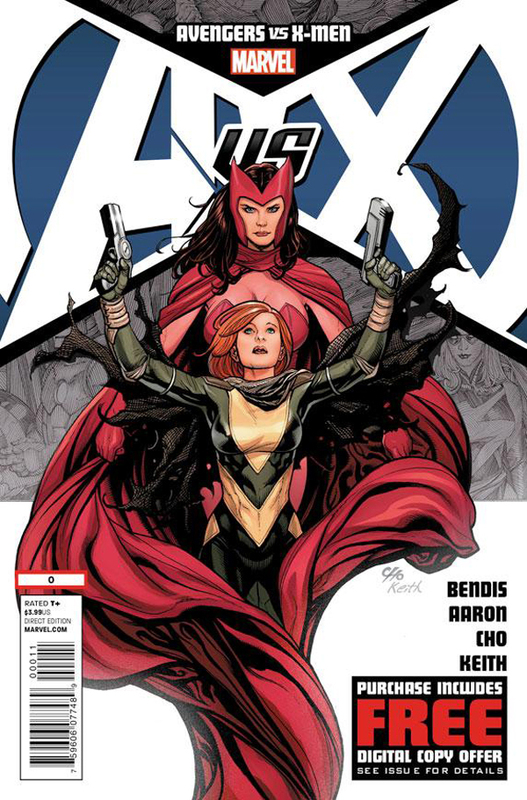 The variant covers for AvX #11 were the hardest to find for the series yet, as orders for the book have reached their lowest ebb and 1:100 and 1:200 variants just aren’t part of the shipment for most stores. This may change for issue #12 as numbers could climb for the final chapter, but as it stands I was only able to find one local store that had copies of either the 1:25 or 1:100 variants for issue #11 available. Please note, the 1:50 Adam Kubert variant was cancelled although it is listed on some web sites as shipping today. 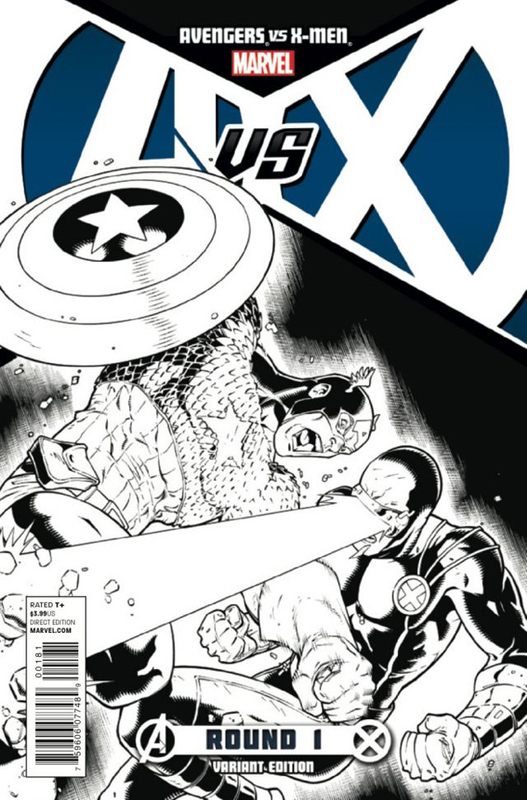 UPDATE: October 3rd, 2012 – Avengers vs X-Men #12. 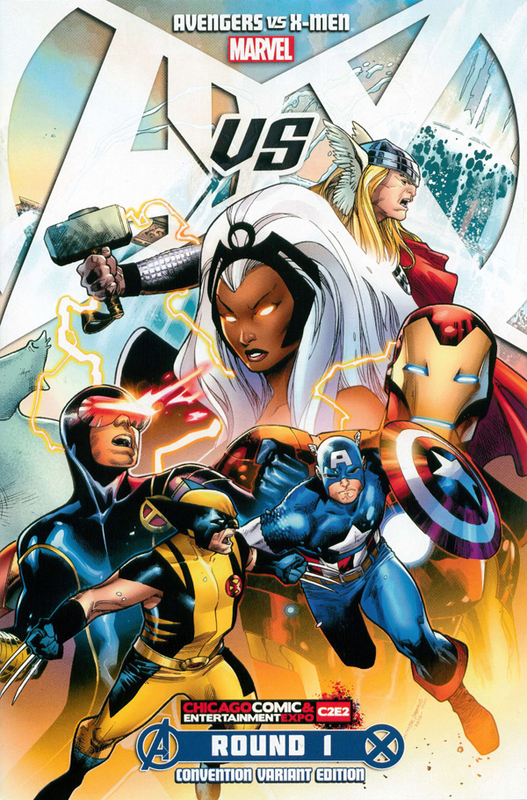 The epic conclusion to Avengers vs X-Men arrives in comic book shops today with an epic eight cover images to close out Marvel’s Summer event. I’m very happy to see Hope Summers and the Scarlet Witch prominently featured on Jimmy Chueng’s regular cover even if Iron Man is taking center stage. It would have been nice to see a bit more of Hope and the Witch throughout the course of this series, but I’m expecting a satisfying role for them in the finale and this image bolsters that feeling. 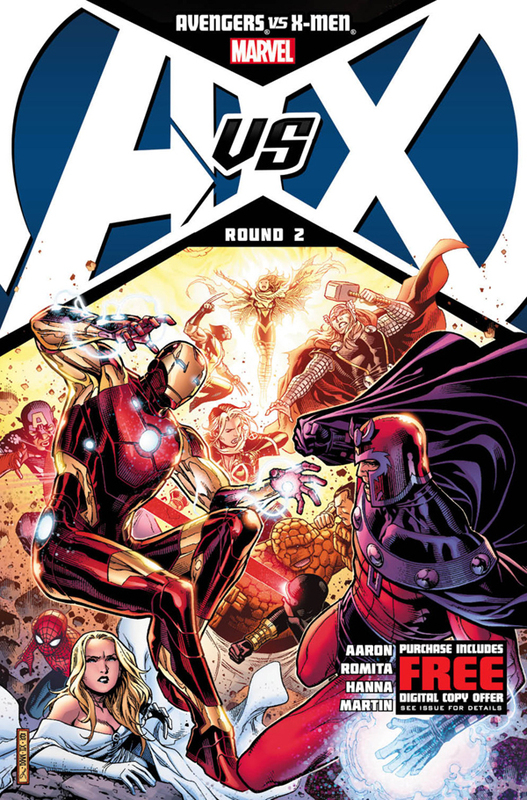 The variants for this issue include the standard 1:25 “fight” image, this time featuring a stunning Iron Man battle with Magneto, along with the Avengers and X-Men “team” variants. As we reach the end, it’s clear some of these images worked better than others and Adi Granov’s contribution for the final issue is among the best. Returning for this issue is the Adam Kubert variant featuring a Dark Phoenix image that may be a fake out for the issue rather than a major spoiler. The 1:50 Kubert variants only shipped with issues that feature his interior art and I have no objection to that. I often wish the interior artist provided the cover art as well with modern books and this allows for that while not disrupting Chueng’s set of standard covers for the series. 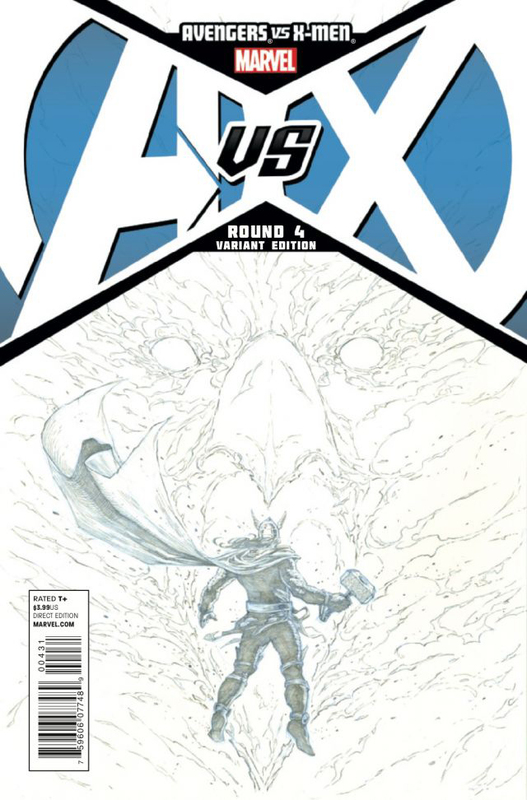 Both the Kubert variant and the 1:100 Jerome Opena (which features the returning Nova who hasn’t been seen since issue #1) variant for AvX #12 were readily available at my local comic shop as orders were indeed up for the series conclusion. Also, returning for the finale was the Hastings Entertainment exclusive variant. 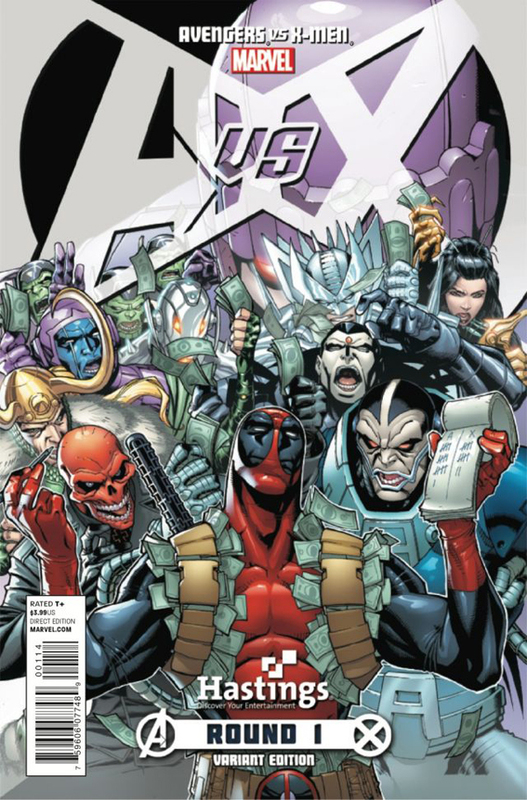 Once again we see Deadpool and a host of Avengers and X-Men villains following up on the betting scene we saw on the Hastings variant for AvX #1. Deadpool appear to be the real winner here and hopefully Marvel’s big event wraps up as a win for their readers.